The major goal of the PACE project is to transform the treatment of patients suffering from critical limb ischemia (CLI) who presently have limited treatment options and poor outcome: 1-year amputation-free survival <60% and 10-year mortality 70%. CLI has a strong social impact and its incidence is rising worldwide, including in Europe. The prevalence of CLI in the population aged 60–90 years is estimated as 1% (0.5–1.2%) with male to female ratio around 3:1. Despite improvements in medical care and revascularization, patients with CLI continue to have a high risk of major amputation (below the knee or higher) and cardiovascular death. Within PACE we will conduct a randomized, double-blind, multicentre, placebo-controlled, parallel group phase III study applying a novel, off-the-shelf allogeneic PLacenta-eXpanded stromal cell product (PLX-PAD) optimized to support regeneration from Peripheral Arterial Disease. We will evaluate the efficacy, tolerability and safety of multiple intramuscular injections of HLA-unmatched allogeneic PLX-PAD cell product for the treatment of CLI patients who are unsuitable for revascularization. The European Medicine Agency (EMA) accepted PLX-PAD as pilot project for the new “Adaptive Pathways to Patients” to ensure timely access for patients to the new therapeutic option. In addition, the PACE consortium will go beyond the traditional clinical trial endpoints of safety and efficacy, by characterizing molecular and functional signature of the PLX-PAD product, by in depth investigating mechanisms-of-action of PLX-PAD cells and by exploring biomarkers for understanding response/non-response in particular patients (stratification and therapy response markers). 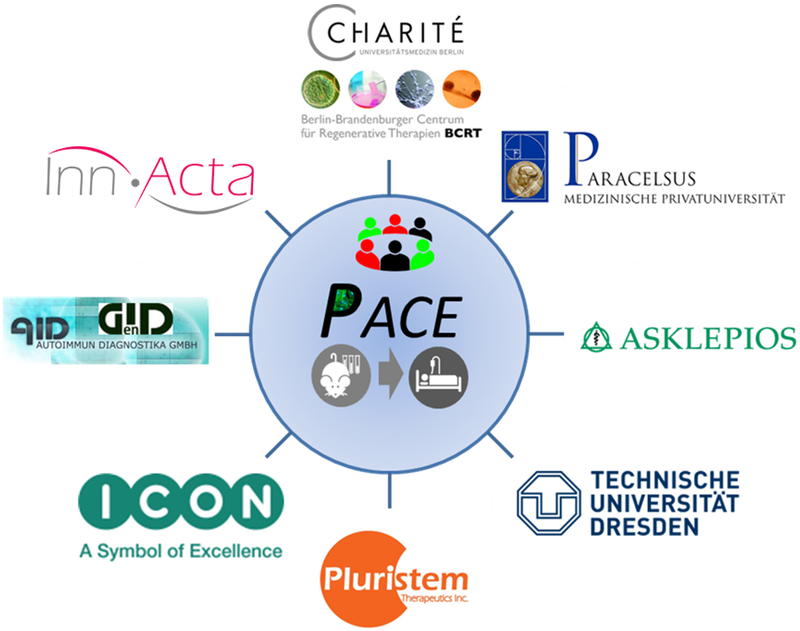 PACE partners are world-leading experts in scalable, clinical grade 3D-cell manufacturing approved by authorities, preclinical and clinical cell therapy, and biomarker analyses with well recognized expertise. Feb February 2019. Update 46 open sites from 9 countries. This project is supported through Societal Challenges (Health, demographic change and well-being) of the European Community's H2020. Grant agreement number 733006.